Recently we completed the first phase of a really rewarding project with the State NRM Office that was all about helping volunteer groups and Not for Profit (NFP) organisations to apply for funding and describe the Natural Resource Management (NRM) work they were proposing to undertake. 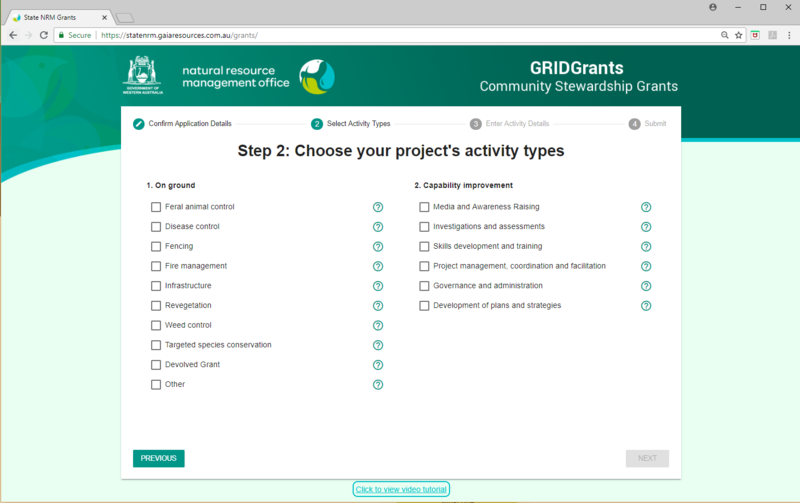 This project involved GRID – our easy-to-use online mapping product for the NRM sector – integrated with a new mobile responsive web application we call GRID Grants. The State NRM Office are a part of the State government Department of Primary Industries and Regional Development (DPIRD) and are involved in coordinating, funding and reporting on NRM efforts in the State. A big part of that is their provision of the Community Stewardship Grants round released in mid 2018. Their existing grant software – while powerful in its own right – did not allow applicants to specify where they were going to be doing particular proposed activities “on the ground”. A whole range of questions could begin to be answered with this data, to do with geographic distribution of activities by type, alignment with regional strategies, and program effectiveness. 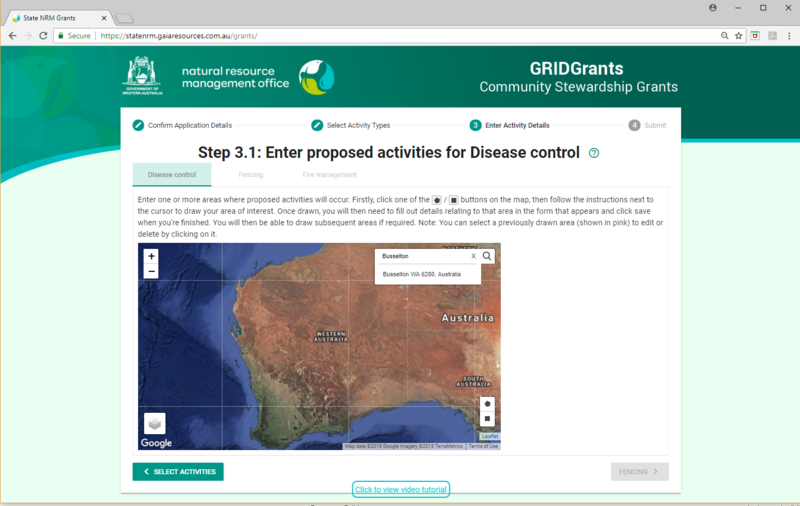 As an existing GRID customer, the State NRM office saw the potential in the web mapping product to help them catalog these proposed activities and to assess and track grant applications from organisations spread all over the State. However, they needed something that would be simple to use with no training required, and guide them smoothly through the steps of their application. GRID with its rich functionality and different modules just wasn’t going to work as an entry point for applicants new to the world of geospatial software. While GRID is great for a range of NRM activities, we were looking here at applicants who initially had one task they needed to achieve. If you think about the experience you get when you use a (good) in-car navigation or banking app, that’s the kind of experience we were going for where there are minimal mouse clicks and buttons involved – as outlined in the accompanying video we made to help grant applicants. Our team for the project, including one of our Technical Leads, Tony Prior, along with fellow software engineer James Patrick and yours truly, were all convinced that there was a good fit between the grant application process and GRID. Something more tailored and targeted to the grant process was needed; at the end of the day the data it would generate is also of importance for State NRM office business processes. So, we designed and implemented a RESTful API (Application Interface) as an enhancement to GRID. This gives us a means of exchanging data between GRID and a separate web application that we developed, called GRID Grants. GRID Grants provides a step-by-step workflow to define proposed on-ground and capability activities like fencing, weed control, and community events. The State NRM office is able to control several aspects of the GRID Grants content through GRID itself. As shown in the video above, applicants can search for a location, specify a number of activities, draw specific features on a map view and enter other relevant data. The RESTful API opens the door for future similar projects where GRID integration is required. It’s also a mobile responsive tool written in Angular, which shows how we can leverage the best frameworks for the solutions that we offer. We didn’t only just deliver a technical solution, though – we wanted to make sure that it worked for our audience before we released it! We do adopt an Agile methodology to software development where it works for our clients and their projects, and this enables client feedback to be taken into consideration during the development of a product. This provided real benefit during the GRID Grants development – we had the opportunity to have a second crack at our “less than ideal” first version. The first time around made sense to those familiar with data entry products, but not to the general public. Through consultation with the client and testing – with real applicants! – we were able to flesh-out an alternative user experience design that ‘clicked’ for people of varying technical backgrounds. With this change, our testers suddenly understood the link between features on the map and the information they needed to associate with that feature. So along the way in the project, we also did some swift pivots to help the client with issues other than just delivering a technical solution. We also developed the YouTube help video above, which the State NRM Office really appreciated when the grant round opened and some 150 applicants suddenly started using the system. We also provided additional phone and email support for the applicants when half the State NRM office got sick in the final days of the application round! We’ve had some great feedback directly from applicants, and we are looking forward to the next phase of work with the State NRM Office to help with even smoother and easier tracking of the approved projects and reporting. Working with the NRM industry is very close to our core mission of enabling our clients to make the positive changes to the environment they look after, and so this is a great opportunity to support the industry even more. If GRID, or GRID Grants, look like solutions that your organisation could use for managing your spatial data, feel free to reach out and start a conversation with either Tony or myself. We can contacted by email, or feel free to kick off a chat with us via Facebook, Twitter or LinkedIn.